Less than a year ago, over 40 organizations launched ICHRP-US, calling for an end to dictatorship in the Philippines and declaring that “resistance is our right and solidarity is our duty.” Since our launch, we organized the Stop the Killings Speaking Tour: The People’s Caravan for Peace and Justice in the Philippines, and have continued forward in building and expanding our coalition, and in waging a campaign against U.S. military aid to the Duterte dictatorship. At this moment, ICHRP-US would like to especially raise the recent indictment of former General Palparan, “The Butcher,” as a clear victory on the part of the people’s movement in the Philippines, while also recognizing there are many still suffering to whom justice has not been delivered. Palparan’s arrest comes in a moment in which one of Palparan’s greatest supporters, U.S.-backed former President Gloria Macapagal Arroyo, is now returning to power as Speaker of the House at the delight of another U.S.-backed dictator, Rodrigo Duterte. While fascism in the Philippines heightens, the people raise the call for peace and justice and wield the truth to reach victory in the case of Palparan, who is only symbolic of many in the Armed Forces of the Philippines who have not yet been tried. As people based in the United States, we bring to the International People’s Tribunal (IPT) our outright condemnation of Trump’s support of Duterte’s human rights violations, and rise in opposition to the military aid that goes to the Philippines. As the amount of aid to the Philippines this year alone has now risen to 184.5 million dollars through Operation Pacific Eagle and investment in the Philippine National Police’s anti-narcotics operations, people in the U.S. continue to lack basic social services and housing while our tax dollars go to violence in the Philippines. In light of this, abhorrence seems too light of a word to describe our outrage at the injustice of Trump and Duterte’s practices — only our actions towards justice can speak properly of our determination. Carolyn Forche, a poet and human rights advocate who covered human rights in El Salvador, once noted to herself: “It is not your right to feel powerless. People better than you have felt more powerless.” In the same vein, ICHRP-US Chairperson Pam Tau Lee expressed: “As people from the United States who find the people’s movement in the Philippines deeply powerful, and as people whose tax dollars fund grave human rights violations in the Philippines, we cannot for a moment feel powerless in our ability to make change. We can only forge ahead and continue to organize at a higher and more courageous level. As our member organizations from the United States watch IPT from afar, we are honored and decisive to deepen and strengthen our commitment to stop the killings in the Philippines, say no to another fascist dictatorship, and strengthen our organizing against U.S. military aid to the Philippines.” Resistance is our right and solidarity is our duty! Free the NutriAsia 19! No U.S. Aid to Philippine National Police! While community and faith leaders gathered for an ecumenical mass on Monday, July 30 amidst the NutriaAsia picket line, Philippine National Police violently dispersed the line and arrested 19 people. The arrestees included Eric Tandoc and Hiyas Saturay, two longtime community organizers from Southern California who were part of a group four journalists covering the NutriAsia strike. Police went so far as to beat and bloody Leticia Espino, an elderly woman and organizer of Kadamay, the largest urban poor alliance in the Philippines. She is now in the hospital without funds to pay her hospital bill. We condemn the violent breakup of the ecumenical mass and the disrespect of the people’s sacred ceremony that affirms human dignity and the workers’ struggle, and we demand an end to the repression of activists and faith leaders. We condemn the continued media blackout and the crackdown on journalists, and we demand the immediate release of the journalists and all those detained. We condemn the brutal treatment and repression of striking workers and their allies, and we call for the broadest solidarity with NutriAsia workers. We cannot downplay any role of the U.S. training and support for the Philippine National Police in the violence against faith leaders, the elderly, or striking workers. While the Philippine National Police claimed that protestors and journalists held drugs and guns, the 20,000 killings at the hands of the Duterte regime have shown the planting of evidence as a worn out and obvious framing tactic when the killings are clearly intentional and out of control. As U.S. based peoples, we condemn and we demand an end to all form of US military aid or training to the PNP. Stop the repression of activists and faith leaders! Stop the repression of trade unions! No US aid to Philippine National Police! Mobilize labor groups to sign onto Trade Union Solidarity Letter. Add Trade Union Names directly to google doc. Donate to the fund set up for NutriAsia workers on behalf of the Asian Pacific American Labor Association. Boycott Nutriasia brands & products: Mang Tomas, Jufran, Datu Puti, Golden Fiesta, etc. During the media blackout on the NutriAsia strike, write statements of support and raise awareness on the situation, particularly amongst workers and trade unions. Share attached memes and banners on social media. Amidst Repression of Church Workers, Expand the Movement Against Tyranny! In recent weeks, three United Methodist missionaries — Adam Thomas Shaw, Tawanda Chandiwana, and Miracle Osma — have experienced the terror of the Trump-backed Duterte regime before all safely returned home in the past few days. In only two years, the Duterte regime has wrought over 20,000 killings and shut down the possibilities of peace talks amidst a fifty year civil war in the Philippines; now, the regime is targeting church workers who work in solidarity with the poor. In February 2018, the three missionaries (Shaw, Chandiwana and Osman) participated in a fact-finding mission — as a part of an ICHRP International Solidarity mission — in rural South Cotabato, Mindanao. The missionaries documented eye-witness accounts of the Lake Sebu massacre in which the Armed Forces of the Philippines killed 8 indigenous farmers. On their way back to the city, Philippine authorities apprehended the three missionaries, along with two others. Government authorities then placed the missionaries on a blacklist for their human rights work, and accused the missionaries of being ISIS members. Most recently, the Philippine government gave orders for Shaw, Chandiwana and Osma to leave the country because of their “political activities.” Chandiwana was detained for 2 months before being deported, while the Bureau of Immigration withheld documents necessary for Shaw and Osma to leave the country. The United Methodist Church since launched a campaign to #LetThemLeave, and Shaw returned to the United States on July 4, while Osman has just recently been released. The three missionaries are among many church workers that have experienced Duterte’s rising fascism. Sister Patricia Fox, a 71-year-old Catholic nun from Australia, also faced threats of deportation due to her work with peasant farmers, but remains in the Philippines after cries of protest from church people across the globe. In December 2017, assailants killed Roman Catholic priest Father Tito Paez, and since then, three other priests have been killed – Father Mark Anthony Ventura, Father Richard Nilo and Father Rey Urmeneta. On July 3rd, a Mayor and United Methodist, Ferdinand Bote, was gunned down. Under the Duterte administration, the suffering of only a few individuals — whether Kian De Los Santos, Father Tito Paez, Jo Lapiro, Adam Shaw, or Sister Pat— has been enough to enrage and move thousands across the Philippines and the world to resist Duterte’s dictatorship. But these names are just a few of thousands who have suffered, and Duterte’s long list of human rights violations are not acts merely against church leaders out of spite for Christianity, nor are Duterte’s violations mere personal attacks on individuals, nor, are these attacks even limited to the Filipinos. Rather, Duterte is waging an all out war against the Filipino people and all those who seek peace and justice in the face of rising fascism, labeling ordinary activists and faith leaders as terrorists. As U.S. military aid continues to support the Duterte administration, Duterte’s all out war is another link in the chain through which U.S. war and intervention holds oppressed people captive across the world. Support the struggle of poor and indigenous communities for self-determination and flourishing: Donate to the Save Our Schools Network as centers of community education and development. Through the United Methodist Church all donations of the Save Our Schools Network are tax deductible and 100% of your donation goes to support the network. To donate online: Go here or go to umcmission.org and search Save Our Schools, Protect Indigenous Life (#3022305). To donate by phone, please call 1-888-252-6174. 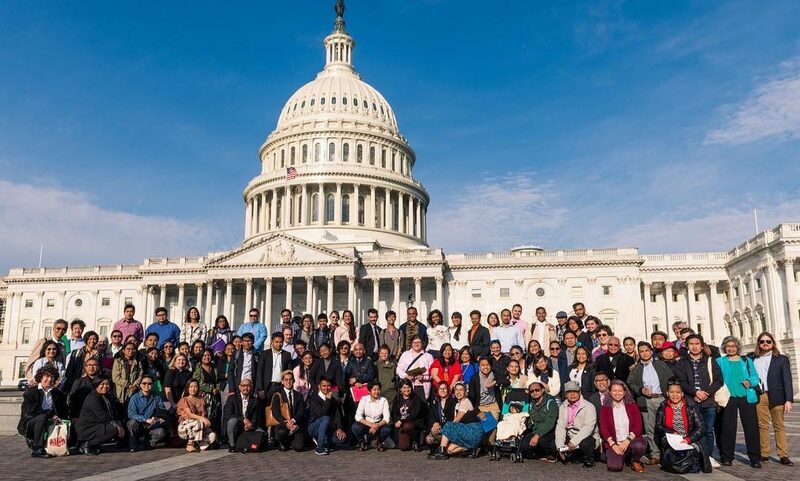 Take Legislative Action: Join congressional advocacy efforts to ensure that U.S. tax dollars are not used to fund the Philippine military and national police. Conduct vigils, write statements, and participate in actions for the people’s State of Nation Address, July 23rd Philippines time. Raise the calls of ICHRP: Stop the Killings! End U.S. military aid to the Philippines! No to Fascist Dictatorship! Resume the Peace Talks! Expand the movement against tyranny — invite churches, organizations, and individuals (whose organization is not yet able to join ICHRP) to join the of the International Coalition for Human Rights in the Philippines-United States!